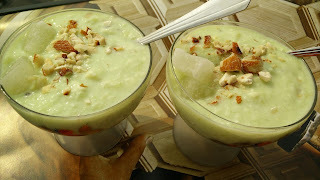 Shahi pudding is made up of Petha, an Indian sweet/mithai. Petha pudding is an Indian dessert usually homemade, commonly served for dinners. 1. Dry roast all nuts till crisp. Crush it. 2. In a heavy bottom pan, boil milk, cardamom powder, saffron and simmer to reduce to half the quantity. Add sugar once milk is reduced, cook for 2 min. 3. Add mashed cheese and cook for another 2 min. Add grated petha and cook again for 2-3 min. 4. Add corn flour in milk till it thickens. Switch off the flame. Let it cool. Add green colour and keep it in refrigerator for cooling. Serve cool and garnish with crushed dry fruits and petha pcs.